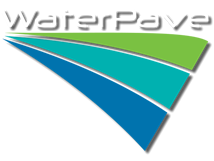 https://www.facebook.com/pages/Waterpave-Australia-Pty-Ltd/503772173029839?fref=ts Click on this link here ^ and like our page for updates and photos of our porous paving product! Watch how the water disappears into the top layer of resin bonded aggregate. Aggregate colour used "WaterPave Gold"